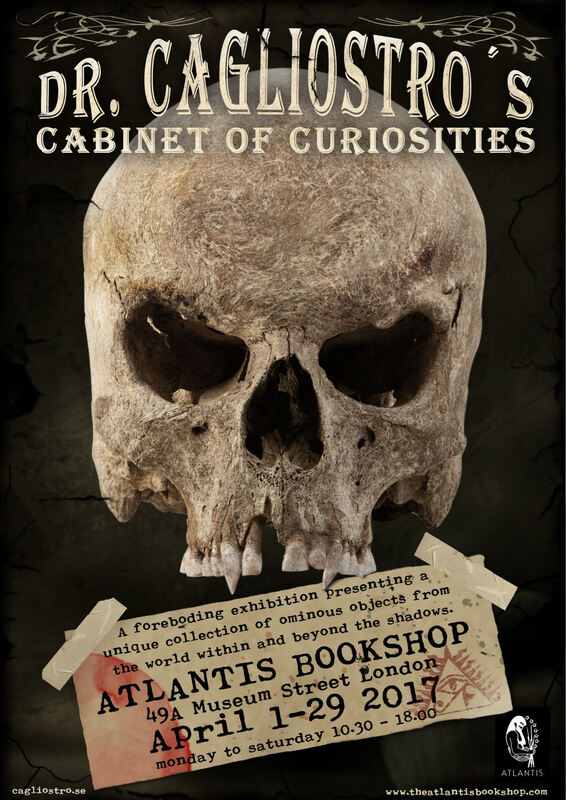 Between 1 and 29th April a brand new exhibition featuring occult artifacts and objects from the collection of Dr Cagliostro's Cabinet of Curiosities will be presented in London. We are very proud and honored to have the famous Atlantis Bookshop as our hosts. Atlantis hosts art exhibitions and esoteric talks, workshops and book launches and has long been a hub for London's occult world. Gerald Gardner attended meetings of The Order of the Hidden Masters in its basement during his formative years, and the shop published his first book on witchcraft, the novel High Magic's Aid (1949). The Dr Cagliostro exhibition will feature some items that has never before been presented to the public. Like a fragment of the famous Golem from Chelm, unique werewolf hunting equipment, and perhaps the answer to the mystery of the lost Percy Fawcett expedition in the Brazilian Amazon 1925. The exhibition will be open Monday to Saturday, 10.30 - 18.00.